There is no doubt about it. 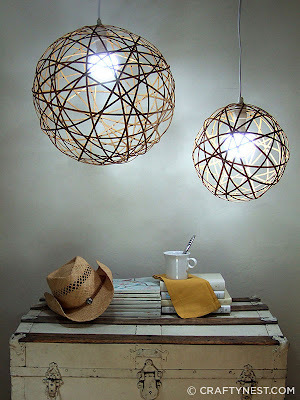 I am blogging about orb lights because I have no electricity! We continue to be without power here in Connecticut however the cell tower nearby has come back online so we can again communicate with the world. Luckily we a have a generator that provides us with some services - like keeping the cellphone and computer charged! 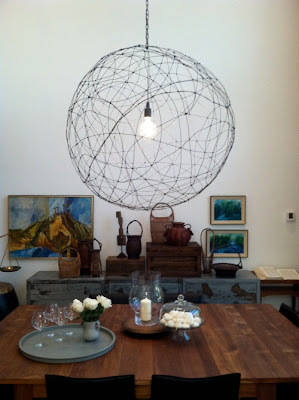 I have a growing collection of links to orb lights handcrafted by DIYers. They have been catching my eye as I breeze through my files - sort of teasing me. I do believe a collection of then would fill the space in the corner of our family room. Check out these various online ideas. 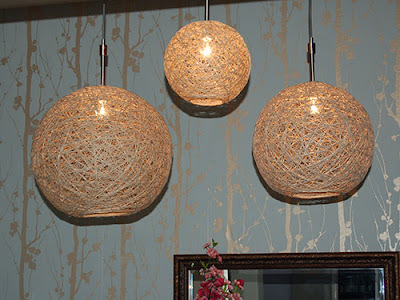 And here is a handmade variation from Crafty Nest. I love the three sizes grouped together. There is a tutorial for this project is located at this link. 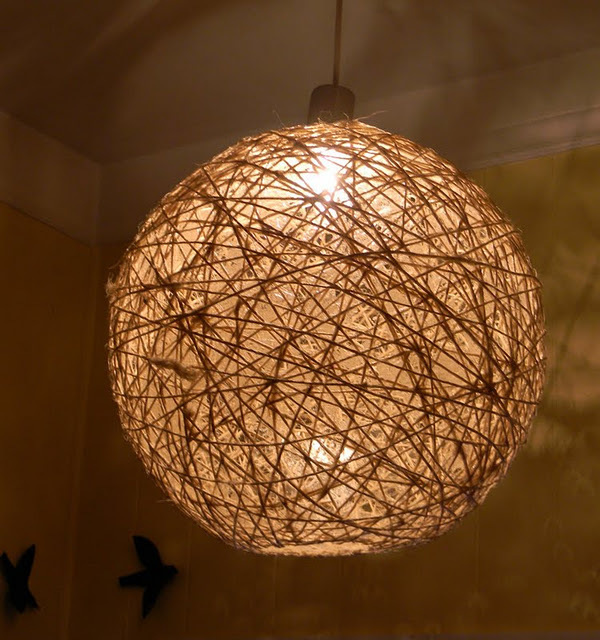 Another version of a similar type of orb lamp is the twine and ModPodge version from The Design Pages blog. An entirely different effect is created by changing material. Orlando Soria creates a contemporary industrial feel by using galvanized wire. 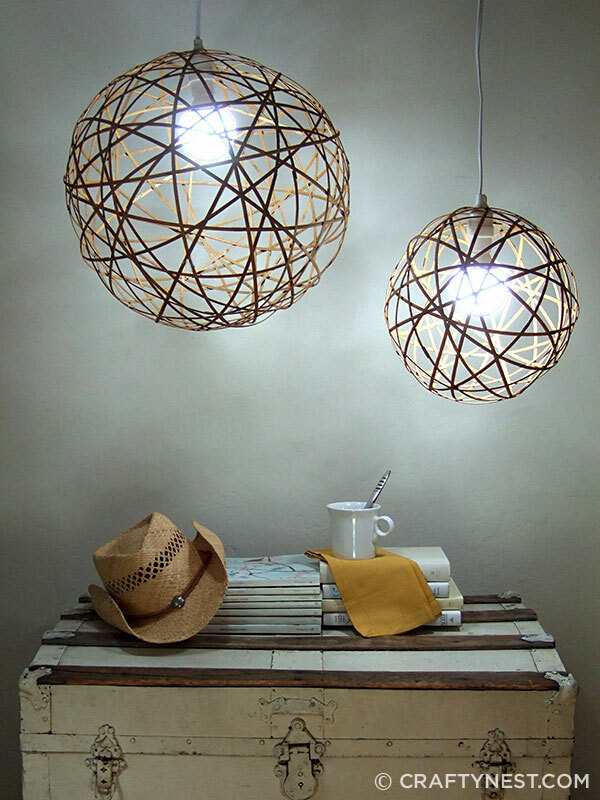 But the one I like best is made from recycling bamboo shades. This example is shared on Crafty Nest with a complete tutorial as well. Not sure it would look could with a pigtail fluorescent bulb though! A trio of these might look just right in the corner over the TV. 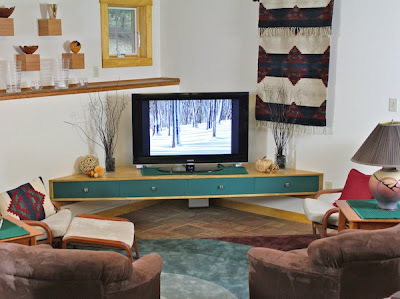 We have a unique "bench" that David and I designed and built that spans the corner of the room. It has power inside and doors to hide all of the paraphernalia required to run the television. 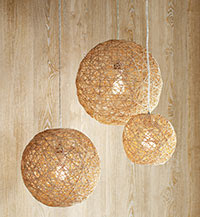 How do you think three orbs in a variety of sizes would look suspended in that space? The handcrafted Navajo rug could be moved slightly to the right but not too far. It hides the electrical panel. This was David's original workshop, not a family room at all. Of course the reality is time. I absolutely must solve the mitten storage dilemma held over from last year first!